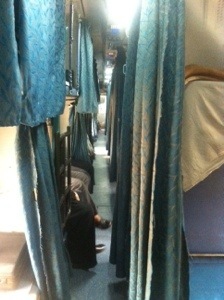 Twoandahalfweeks in India – from Coimbatore to Cochin by train – Go India, go future! It is 4.20 hrs am when we leave our KKSD training center where we stayed the last days. A beautiful location, just half an hour away from Coimbatore. Our next destination is Cochin – by train. Whoever had been to India and seen trains passing by knows that this is an adventure – included into the ticket price, without extra costs. At the railway station in Coimbatore there are already people running through and back, some just stand and wait while trains pass by, others who sleep on the ground. It smells bad. How crowdy might it be at full day time … or even during rush hours. Finally, also the train to Cochin arrives. We step in, one after another. Inside it is dark. A very small corridor. On the right 4 beds each repart, on the left two beds along the corridor. The space in between – there where we pass with our luggage – is little. People are sleeping with curtains closed. Where are our damned reserved seats? We stand in line along the dark small corridor, communication becomes difficult. Impossible to go back or even turn around. 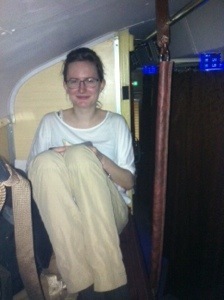 Indian trains are definitely not considerable to person who suffer from claustrophobia. However, we arrange after a while. We all have found some empty spaces where to put the bags and sit down. Indian style. Maybe two weeks ago we would haven taken it a la German… Now, it is no problem at all. 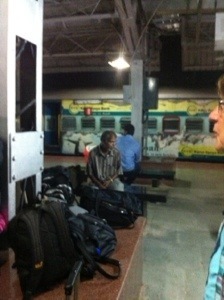 Going by train in India is fine. I have taken an upper 'bed'in two, together with a friend. We put everything there and arrange ourselves somehow in between. From above – from our 200 x 0,7 cm ‘bed’ – we have the overview 😉 in front of us people are still sleeping. But through a small window 'downstairs' we see that a new day has started. It gets a bit more light in. 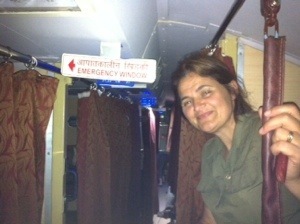 Maybe I will find then also the emergency window. I mean the one for when you need to escape could be the right one. At least the sign is hanging in front of me. But what could happen …pure nonsense just to imagine an urgent case. Better to enjoy a chai from the man who passes by with this typical chai container. 7 ruppies, means roughly 10 cent (EUR). The remaining time I spend close to the train doors, or better there where you can just step in and step out. There are doors open during the travel. You can just stand there, feel the blowing air and see the world passing by in front of you. Little risk, and much fun.